File photo of Rajnath Singh. File Image . 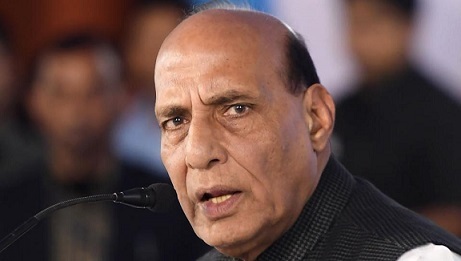 The Union Home Minister Rajnath Singh has called for an urgent meeting with all the Chief Ministers of the Northeastern states on Citizenship Amendment Bill on Friday. The meeting will take place at the North Block at 3 pm. Such a meeting was earlier convened by Rajnath Singh himself after unrest erupted in Northeast following government’s decision to pass the controversial bill. In a recent meeting with Meghalaya Chief Minister Conrad Sangma, Singh had said that Home Ministry would convene meeting of all Chief Minister of Northeastern states at the earliest. A few BJP ruled states and BJP-supported state governments have openly opposed the Citizenship Amendment Bill. Manipur and Meghalaya have opposed the bill. Meanwhile, reiterating their positionover the controversial Citizenship Amendment Bill, opposition leader in the Rajya Sabha, Gulam Nabi Azad on Thursday said in an all-party meeting that they would not allow bringing any controversial legislation in the Rajya Sabha. Sources said that Azad cleared the Congress’ and its UPA allies view during the all-party meeting that took place at the Vigyan Bhawan annexue ahead of the last budget session of the present government.